Plant-based edible vaccines. 3D-printed prosthetic hands. Snacks beloved by New York City’s pigeons. 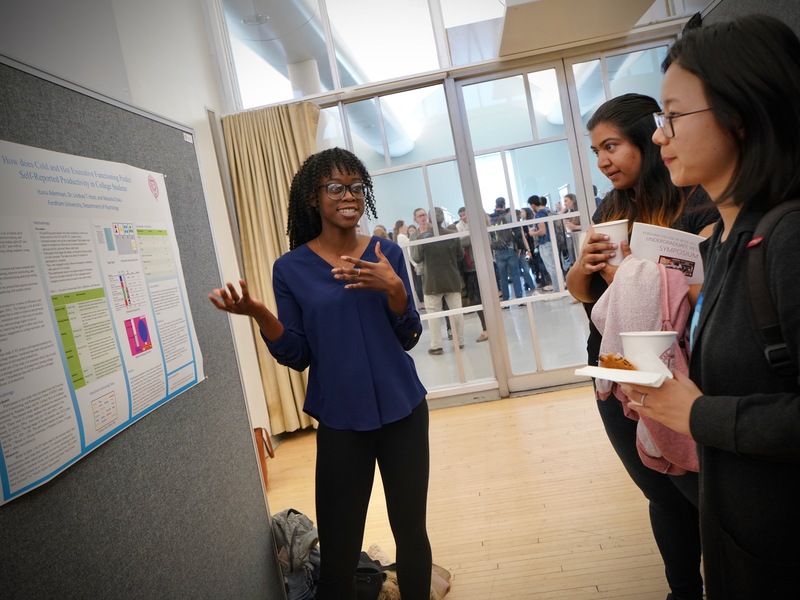 These were among the 161 projects presented at the twelfth annual Undergraduate Research Symposium at Rose Hill on April 10. 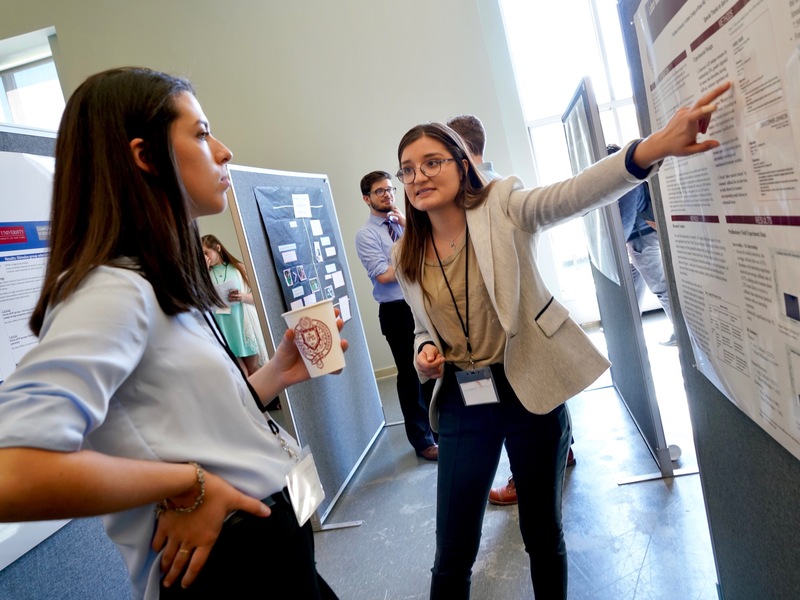 The symposium was part of Fordham’s first-ever Undergraduate Research Week, which celebrates undergrad research at Rose Hill, Lincoln Center, and the Gabelli School of Business. The Rose Hill symposium marked a milestone in Fordham history. Since the University’s first symposium in 2007, students have co-authored more than 100 publications with faculty mentors. More than 150 students are first or second authors on non-Fordham conference presentations. And their research has made its way to conferences across the U.S. and beyond, as far as France, Germany, and Spain. 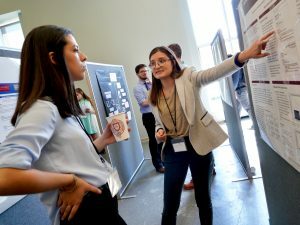 Through oral presentations and glossy research posters, this year’s symposium showcased the work of more than 300 undergraduate students across disciplines. Does An Internship Lead to a Post-Graduation Job? To find out, Anastasio and her colleagues created more than 1,400 fake resumes for 2018 graduates applying to summer and fall positions based in New York City. Each resume pair was virtually identical. However, only one had internship experience; the other had campus-related experience. Every pair was then submitted to the same, real-life job application. In total, Anastasio’s team applied to more than 700 jobs. Then they waited to see which resumes received call-back interviews. They found that those with internship experience were more likely to receive a call-back than those who didn’t. However, their results also varied by job industry. In the finance sector, resumes with internship experience received call-backs 6.3 percent more than those without. But in the human resources and marketing industries, those numbers were 2.4 and 2.8 percent, respectively. Which Skills Lead to Higher Productivity in College Students? Itunu Ademoyo, FCRH ’19, wanted to pinpoint which skills predict better productivity in the workplace. There are two types of skills: “cold skills,” which involve planning and working memory, or “hot skills,” which involve emotional perception, sympathy, and social connection, she said. She and her partner Natasha Chaku, GSAS ’20, asked 30 Fordham students to complete online games and a survey, which evaluated their mental skill set. After analyzing the students’ results, Ademoyo found that cold skills, which are linked to academic achievement and success, predicted higher productivity. She said that these tests could be a handy tool for employers across disciplines. William Beatrez, FCRH ’19, is helping to develop more efficient fuel cells for cars—cells that are good enough to make renewable energy a viable way of powering vehicles, rather than nonrenewable resources. 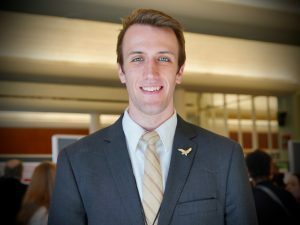 Beatrez is a chemistry major whose research focuses on nanotechnology and renewable energy. Through a collaboration between Fordham and the University of Connecticut, he and his team have synthesized a new type of catalyst, he said. Catalysts are microscopic substances that speed up chemical reactions. Normally, they aren’t hollow. But Beatrez and his team decided to do something different. These catalysts are present in fuel cells. And the faster the catalyst, the more efficient a fuel cell can be. Lauren Beglin, FCRH ’19, delivered one of the 39 oral presentations at the symposium. She spoke about her research with dye-sensitized photoelectrochemical cells—devices that can convert sunlight into chemical energy. “Think solar panels, but instead of generating electricity, they generate chemical compounds,” said Beglin, an environmental science major and chemistry minor. These compounds can be used for fuel cells, a type of cell that can cleanly produce electricity, water, and heat. The only problem, said Beglin, is these cells are expensive and difficult to produce on a widespread scale. Her research aims to increase their efficiency. Just two weeks ago, Beglin’s team made their first batch of devices in the lab. Beglin, a graduating senior, won’t be able to watch her project grow. 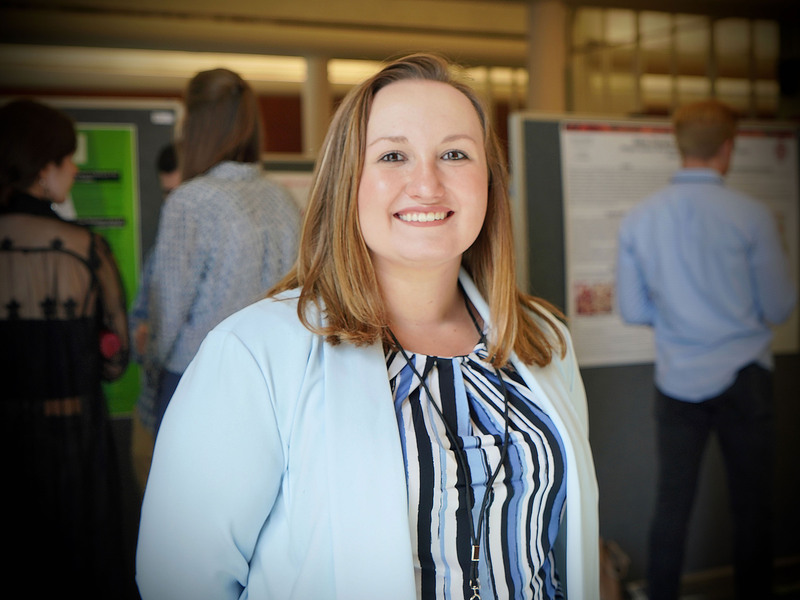 She recently accepted a teacher-in-residence position with Achievement First Public Charter Schools and will be working toward becoming a high school chemistry teacher. But her team has recruited a student to continue her work. “I’m looking forward to passing on my project to the next generation,” Beglin said. With 38 presentations filling Platt Court and more than a dozen performers and artists spread out through galleries in Lowenstein, plus a makeshift dance studio downstairs, Fordham College at Lincoln Center’s annual Arts and Research Showcase highlighted student research on a wide variety of topics. 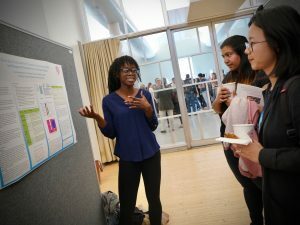 Dubbed ARS Nova, the event featured poster presentations on biology, history, chemistry, and psychology as well as choreography, painting, and acting. 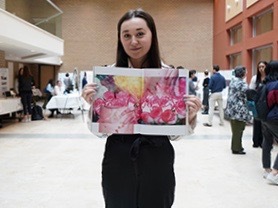 For senior Katrina Arutunyan, who was participating in the ARS Nova undergraduate research fair at Fordham College at Lincoln Center on April 11, her research didn’t pan out as she had hoped. 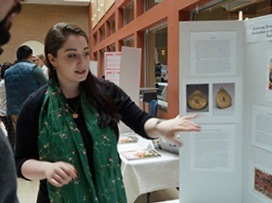 Arutunyan, an art history major, was examining the Round City of Baghdad, which was built in the 8th century and resembles a spoked wheel with the caliph’s palace at the center surrounded by a swath of empty space. Arutunyan interns at the Islamic Art Department at the Metropolitan Museum of Art. She worked her contacts and they helped her find additional sources. 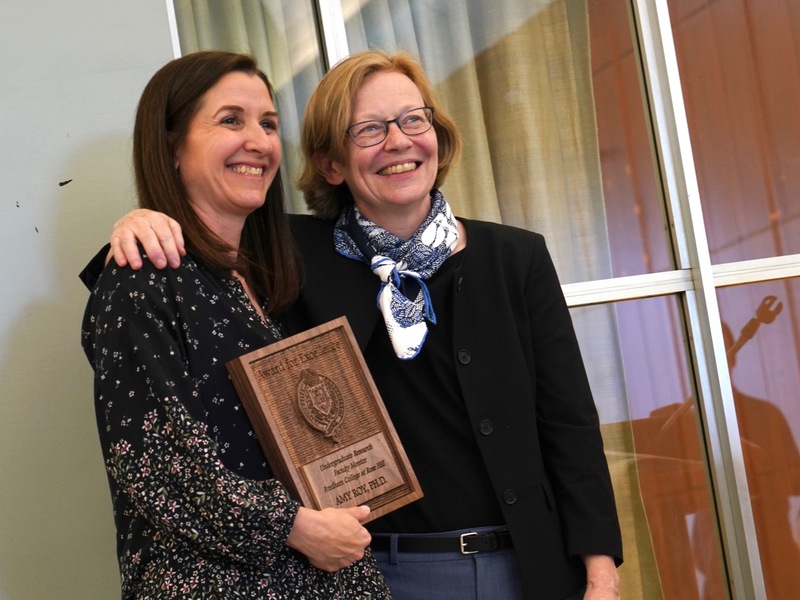 She tapped into the Aga Khan Documentation Center at the Massachusetts Institute of Technology, where she connected with expert resource librarians. She eventually concluded that the design had more to do with defense purposes than the stars, even though she found that the caliph had consulted several astronomers before building the city. “When I first read that, I got really excited, because I thought I was about to get proven right, but really, the astronomers were more for what were called electional horoscopes, which basically calculates the best day for you to do something with a big event, like the establishment of the city,” she said. She continued to dig, and found similar designs in the Firuzabad Plain of Iran, in a city called Gur. There too, defense was the central design component. With funding coming in from the Fordham Undergraduate Research Grant, Arutunyan said she felt she “wasted Fordham’s money.” But her adviser, Maria Ruvoldt, Ph.D., chair and associate professor of art history, told her that it was quite the opposite. “My adviser basically told me this happens all the time, especially in art history and especially with cases of something that is so old that we barely have any documentation on,” she said. Arutunyan said the experience has only whet her appetite to find work in museum administration. 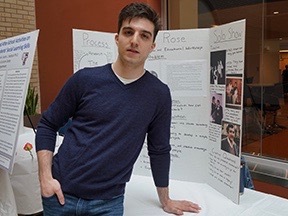 Senior James Kenna took a familial approach to his project, titled Italian Rose. The theatre major’s research combined a solo show and an educational workshop. The project sprung from a need he saw as a teaching artist in public schools that are cutting back on the arts. “As artists, the impetus is on us to keep arts education going and provide the next generation of artists with the tools that they need,” he said. The show, which is about his grandfather Harry, who he never knew, was created through a series of interviews with family members. He traveled back to his high school alma mater in central New Jersey to perform the piece, offer a workshop, and show students how it was created. Even with concrete strategies in place, Kenna said the project took some unexpected turns. In interviews with his Italian American family, he began to get the sense that some family had dealings with the mafia. In the play, he plays all the characters, including the grandfather he never met, and whom family members say he looks like. 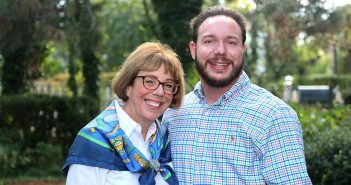 He also plays his great Aunt Rose, who provided him with the richest material. The two poured over the journals and black and white photos as his aunt reminisced. When junior Emma Childs was in high school, she created a magazine called Childs Play. At Fordham, she honed her publishing skills by majoring in new media and digital design. 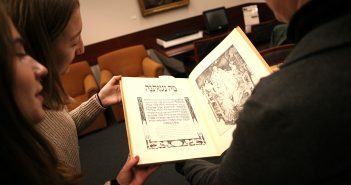 That, plus a Fordham Research Grant, allowed her to realize her high school dreams in print and online with a website. “The grant enabled me to print, commission photographers and models, set up the website, and allocate funds for sets and production,” said Childs. “We discussed how privilege plays into their lives, whether it’s with race, social media, women’s health, menstrual health, and then whether they’re privileged or a victim of the systematic oppression,” she said. Childs called herself a one-person team, so she had to create deadlines and make sure they were met. She said that she was very happy to be able to use whichever media she finds best to address a subject. “I personally always want text, because a big part of how I process things is through reading, but sometimes a photo or video is all you need,” she said. 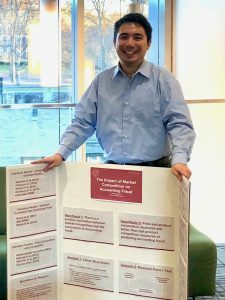 On the same day as the Rose Hill symposium, the Gabelli School of Business hosted its eighth undergraduate business research conference, where students shared their original findings. Does Market Competition Lead to Accounting Fraud? John Lichtmann, a senior at the Gabelli School of Business, wanted to know if market competition could predict a company’s likeliness to commit fraud. To find out, he conducted statistical analyses on financial data for several firms between 1991 and 2011. He measured multiple factors: the size of firms, profit margin measures, complex codes. Based on his research, he thought there would be no correlation between marketing competition and the probability of fraud. But ultimately, he found that competition helps mitigate fraud.